Aniseed Myrtle or Anise Myrtle (Syzygium anisatum), is also called Native Anis or ringwood, is native to the Australian rainforest of southern Queensland and northern New South Wales. While being somewhat rare in the rainforest it has been grown commercially since the 1990s to meet a growing demand for its leaves. In Australia, the leaves are used as a Bush tucker spice or bush spice. Australian bush spices are the leafs or fruits of native plants of Australia used to season food or boil tea. Due to the anethole content, Anise Myrtle imparts a rich aniseed flavor. Aniseed myrtle is closely related to cinnamon myrtle (Backhousia myrtifolia), curry myrtle (Backhousia angustifolia) and the much more commonly known lemon myrtle (Backhousia citriodora) and traditionally, the aborigines used the leaves to flavor foods cooked in earth ovens and to prepare drinks. 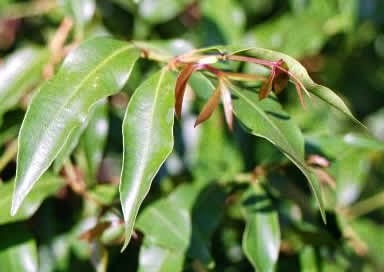 The leaves of aniseed myrtle are very aromatic and have a flavor and aroma very similar to true aniseed. As a result, the trees have been grown commercially since the 1990s for their essentail oils, which are used in making perfumes. The flavor of the leaves has also made them popular for aficionados of 'bush food'. Dried aniseed myrtle leaves have grown in popularity and are now sold both as a culinary herb and for making teas. Because of its powerful aroma, Aniseed myrtle has found favor as an aromatherapy and for diffusion applications. The Anise Myrtle leaf is one of the highest known sources of the compound anethole which gives it the aniseed flavor and aroma. Anethole is also used as a flavor masking agent, expectorant, sedative and stimulant in cough medicines. Plants containing anethole (such as Anise Myrtle) have traditionally been used to assist with weight loss, lactation and stomach complaints. Trans-anethole rich herbs have traditionally been used to treat conditions like anorexia, belching, hiccupping or reflux and persistent epigastric pain. It is regarded as an antiseptic, bactericide, cancer-preventative, carminative, dermatitogenic, expectorant, fungicide, gastro stimulant and insecticide. Anecdotally, anethole settles intestinal cramps, colic and flatulence. It has applications within the fragrance industry for cosmetics. Research indicates that anise myrtle oil has antimicrobial activity. Anise Myrtle is being used as an aniseed or licorice flavoring agent in a number of foods and beverages. The aroma and taste, makes it one of the most popular and versatile native Australian herbs available. Aniseed myrtle leaves can be purchased dried, ground or flaked and provide a strong taste and smell of anis, liquorice or Pernod. The pungent spice should be used in small amounts and easily becomes over powering. In most recipes, Native Anis may be used as a good substitute for aniseed or star anis. This spice is commonly used in marinades and sauces, for meat, baked goods, as a herbal infusion, and in dips or desserts. Aniseed myrtle is sometimes sold as Anisata or Anisata spice which is also used as a flavoring in rice, seafood, stocks, sauces, breads, biscuits, pastries, desserts, ice-cream, beverages & tea blends.